Give Now to Cyclone Idai Victims! Imagine a new mother in rural Vietnam who just gave birth in her home to her first, precious baby. The baby seems healthy at first but slowly becomes restless, breathes at a rapid pace, flares her nostrils and her skin has a bluish tint. The mother takes her to the local hospital and the doctor suspects the infant is suffering from a collapsed lung – when air leaks from the lung into the chest cavity. However, the hospital does not have the expensive portable x-ray machine needed to diagnose this condition. Also, transporting the baby without oxygen could be dangerous. The new mother is out of options to help her baby girl. IRT is working throughout the country of Vietnam to train doctors and nurses in the care of sick and premature infants after birth. One method taught during these trainings is called transillumination, a process of using small, inexpensive LED flashlights to diagnose a collapsed lung. A collapsed lung, also known as Pneumothorax, is a fairly common condition in premature babies that can build up pressure on the heart and lungs leading to a medical emergency. Transillumination is an inexpensive and quick way for doctors without many resources to diagnose babies with collapsed lungs. The doctor only needs to hold a high-intensity light to the baby’s chest to illuminate possible air pockets. The effect is similar to shining a light inside a carved-out pumpkin. 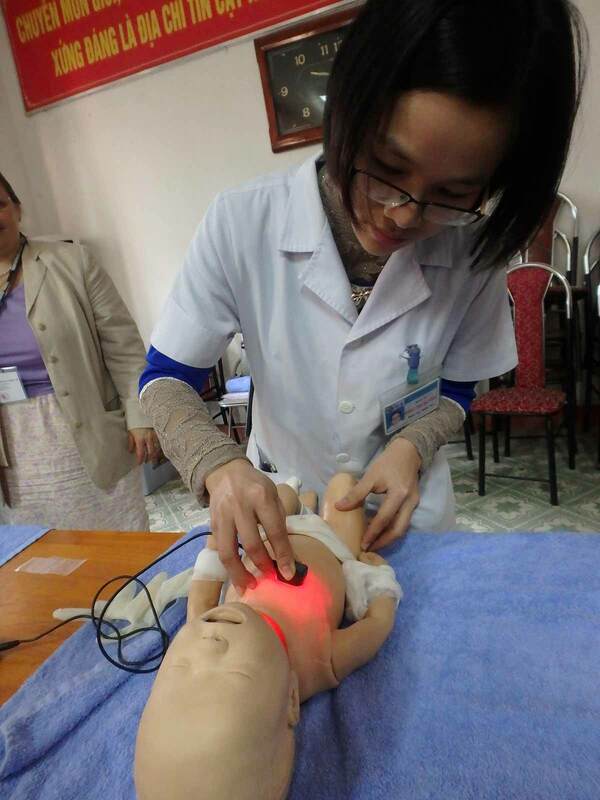 The Vietnamese doctors and nurses taking part in the IRT training sessions as part of “Project Healthy Baby” were delighted to learn of this simple and potentially life-saving technique which they can use in their practice and teach to their colleagues. Also, because of your generosity, we provided each participant with a small high-intensity light to take back to their nurseries. What a difference a small, low tech item can make in saving babies’ lives! We Change Lives and So Can You! Sign up to receive inspiring stories and learn how you can help.